Here is a great picture from one of my tasters from last Sunday. 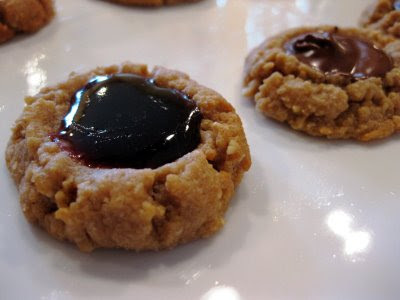 Shown are a peanut butter + concord grape jam cookie and a peanut butter + chocolate cookie. The recipe is a very optimized version of the flourless peanut butter cookie. I'm not posting the recipe until it wins a recipe contest, hopefully. These are perfect . . . finally!